I love the spongy feel underfoot of an autumn carpet of damp leaves. This one's a real beauty! Very nice Don! 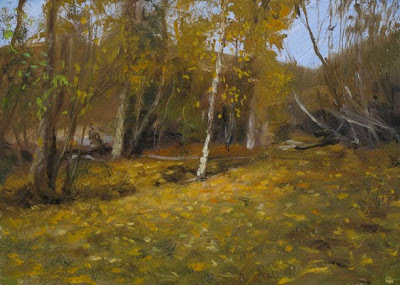 I like the color harmony and the way you painted the dense woods with effortless brushwork. Don, This has a lively feel to it. The brush strokes are great. Thanks, Steve. Sure enjoying your recent paintings. Perry, thanks a lot. You're a very fine painter. Thanks a lot, Nate. Nice to see your new paintings--you're going great guns!